In my immediately previous post, I touched on a particular hobby-horse of mine, which is how the terms "liberal" and "conservative" have become unmoored from their earlier definitions and have come to encompass differing and sometimes contradictory meanings. It turns out that El Cabrero, at The Goat Rope, has been thinking along the same lines, especially as regards conservatism. His reflections on Burke, here, are especially good, but it's well worth going back to the beginning of his series of posts on this subject (they start on February 26) and reading them through. Since the news about the TXU deal came out, I've been waiting for the "conservative" reaction. It came on February 28 in this article, by Howard Husock of the Manhattan Institute, on the op-ed page of the New York Sun. TXU, the holding company controlling the largest electric utility in Texas, is being acquired by a group of investors that includes Goldman Sachs, KKR and Texas Pacific Group. Most of TXU's generating capacity consists of plants that burn the relatively low quality lignite coal that is plentiful and cheaply surface-mined in Texas. Coal burning power plants are a major source of carbon dioxide emissions; lignite burning plants are especially so because more of it must be burned to produce a BTU of energy than of higher quality coal. Lignite is also "dirtier" in other respects, producing more particulate matter, mercury and NOx emissions than other kinds of coal (see here). Before the deal was negotiated, TXU had announced an ambitious expansion program, based on its projections of demand growth, which would include building eleven new coal-fired generating plants. Not surprisingly, this program was opposed by environmentalist groups, as well as by the neighboring state of Oklahoma. The investor group seeking to buy TXU decided to negotiate with these groups before completing the terms of the purchase, hoping to avoid efforts to derail the deal that would be expensive and time-consuming for the buyers. They reached an agreement under which they promised that, if they acquired TXU, they would build only three of the eleven planned new plants, and would cooperate with efforts to develop federal and state legislation governing carbon emissions and energy efficiency. So, from a "conservative", free-market perspective, what's not to like about this deal? It's the result of negotiations freely entered into between private parties, with those on one side of the table evidently believing that it will maximize the value of a very large investment. It could even be said to be a demonstration of the Coase Theorem, beloved of free market theorists, in action. Mr. Husock makes a clever move; a bit of intellectual JuJitsu. He frames the issue in such a way as to make the deal appear suspect from a left-of-center perspective. Note the headline on his article: "Privatization of Politics". Privatization is an off-color word in left-liberal* circles, while politics is celebrated as the arena in which the people's will can be made manifest. Privatization of politics therefore connotes a double whammy. The substance of Mr. Husock's argument is this: the question whether the public interest is better served by building eleven power plants to meet projected demand growth or by reducing carbon dioxide and other pollutant emissions while promoting energy efficiency and alternative sources is a question of public policy. Decisions on such matters "should not be made in the private arena, but in the public realm by elected officials." Mr. Husock then notes in dismay the particular vulnerability of consumer products manufacturers and distributors to the influence of advocacy organizations that may threaten or incite consumer boycotts to force the companies to modify their practices. He specifically mentions pressure brought on Home Depot by the Rainforest Coalition to deal only with suppliers who engage in "eco-friendly logging practices", on Wal-Mart by Wal-Mart Watch to provide health insurance for employees, and on Nike by Vietnam Labor Watch to enforce standards concerning the treatment of its suppliers' workers. Mr. Husock carefully states that he doesn't mean to imply that reducing carbon emissions, protecting rain forests or providing health care coverage and other benefits to workers is in each instance the wrong policy choice. He only objects to the "undemocratic" way the choices are, or might be, made. But, in each instance, hasn't a choice been made, opposition or not, pressure or not? To consider the case of TXU, a decision to build eleven power plants is as much a public policy decision, by which I mean simply a policy decision that affects the public, as one to forego building eight of them while pursuing alternatives. Mr. Husock might argue that TXU's directors, in deciding to pursue the building program, did not consider issues of public policy but only sought to do what their fiduciary duty to shareholders requires them to do: maximize share value. Might they, however, guided by the same principle, have decided otherwise? Utilities have, in the past, erred in projecting demand by simply extrapolating existing trends, and, as a result, built excessive capacity which caused them to incur unnecessary costs. Might the directors also have concluded, even absent active opposition by environmentalists to the expansion program, that in view of present uncertainties a more cautious approach was in the company's best interests? Are shareholder interests always best served by directors and managers who take the most aggressive possible position on all questions concerning expansion, environmental matters, employee relations, product safety and the like? Efforts by government to circumscribe the discretion of corporate boards and management, even when ostensibly meant to protect shareholders, have been regarded very skeptically by conservatives. In any event, the private equity investors seeking to buy TXU from its shareholders had no fiduciary duty to those shareholders. It was the duty of TXU's directors to protect the shareholders by evaluating the offer and advising shareholders if they considered it fair, which they did. "Yes," Mr. Husock might say, "but if it weren't for those pesky environmentalists, the investors would likely have gone ahead with the program as planned, instead of gutting it. In any event, the Governor of Texas evidently wanted those plants built, and built fast, because he directed a state agency to expedite the process of approving them." Nevertheless, the government of Texas, like that of all other states and the federal government, has a tripartite structure characterized by separation of powers and "checks and balances". As Mr. Husock notes in his article, "America has elaborate political and regulatory arenas in which to referee disputes about costs, benefits, and values." All the environmentalists (and the state of Oklahoma, itself a political entity) have done in this instance is to enter those "arenas" to state their case, as is their right under the "redress of grievances" provisions of both the U.S. and Texas constitutions, as well as the "freedom of speech" clause of the First Amendment. If this is "undemocratic", it is so only to the extent that constitutional bills of rights limit the powers of democratically elected governments to oppress or silence individuals or groups. Groups such as the Rainforest Coalition and Wal-Mart Watch, which seek to mobilize consumers or investors to influence business decisions, also have the constitutional protection of speech afforded by the First Amendment. Mr. Husock might respond that he is not advocating the abridgment of these groups' rights, just arguing that directors, managers and investors should always ignore them. Perhaps he has in mind the well-known observation by Adam Smith about "those who affect to trade for the public good." Nevertheless, might it not be possible that a business decision that happens to comport with the goals of an advocacy organization would also be in the best interests of the owners of the business, and not an affectation? Addendum: Keifus (see "comments" below) notes his disagreement with the conclusions drawn in the article to which I linked above for the Adam Smith quote. I linked to that article just because it was the only source for that quote that I found in my Google search that had the quote up in the first sentence. I haven't read the whole article, but I suspect I would agree with Keifus. Second addendum: I'm having second thoughts about my claim that the TXU deal may represent an application of the Coase Theorem, at least to the extent that the opponents of the expansion program use statutes such as the Clean Air Act, or state analogues thereto, as grounds for their opposition, because such statutes or regulations may be considered an ex ante allocation of property rights. I don't think this does serious damage to my basic argument. *I've used the hyphenated term "left-liberal" here to mean what "liberal" has come to mean in present day American political discourse with respect to economic issues, i.e. one who believes that government should intervene in the working of markets to pursue objectives of safety and fairness. This is as opposed to the classical definition of liberal, which now has given way to "libertarian", a political category that is generally considered "conservative" (although there are those who call themselves "left libertarians"), despite the differences libertarians have with classical, or "Burkean" conservatives and with the more radical social conservatives found on the "religious right". This is why I put "conservative" in quotation marks in the first and fourth paragraphs of this post. I think the authors of the Political Compass have it correctly: political positions cannot be described on a linear left-right axis. Instead, they should be measured on two axes. One measures attitudes on social issues, with extreme authoritarianism ("fascism") at one end and rampant libertarianism ("anarchism") at the other. The other measures economic views, with communism at the extreme left and "neo-liberalism" (basically laisser-faire) at the extreme right. As a result, the political position of any individual or party can be shown as a pair of Cartesian coordinates falling into one of four quadrants defined by the two axes. An example, plotting the positions of British political parties in the most recent election, is here. I chose this example because it includes examples in all four quadrants. My own position is in the lower right quadrant. I'm about as far down on the social axis, i.e. tending towards anarchism, as the British Greens, and slightly to the right on the economic axis, a bit to the left of the Liberal Democrats. We haven't had much snow in Gotham this winter; mostly evanescent dustings that tantalize kids but don't leave enough to make decent snowballs. There was a respectable fall a week ago Friday, but, as is wont to happen here on the coast, the precipitation changed to sleet, then rain, melting most of the snow and leaving an ice-crusted, dirty remainder that was gone in another couple of days. Last night, it came down good and heavy. This morning, I pocketed my camera and headed to Manhattan with my daughter, she to resume school after a week's break and me to take a walk along the Battery Park City Promenade, as I often do after dropping her off. 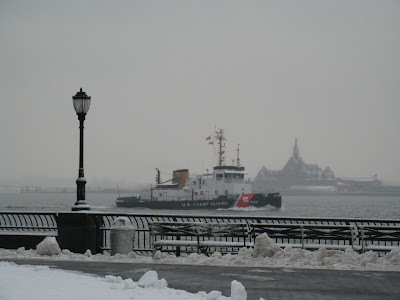 I was approaching the Promenade as a Coast Guard bouy tender sailed by. The building in the background is the former Jersey City passenger terminus of the Central Rail Road of New Jersey, where travelers and commuters would change from trains to ferries to reach New York City. 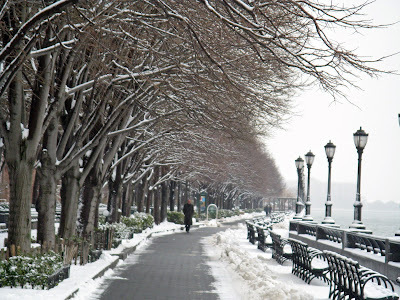 Below is a view looking south along the Battery Park City Promenade. 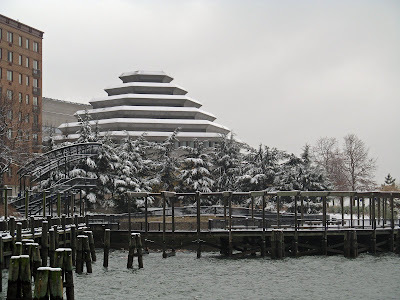 Looking across South Cove, I saw this striking view of the Museum of Jewish Heritage, with an evergreen grove in the foreground and the Liberty Crown belvedere, my favorite substitute for a Stairmaster, to the left. 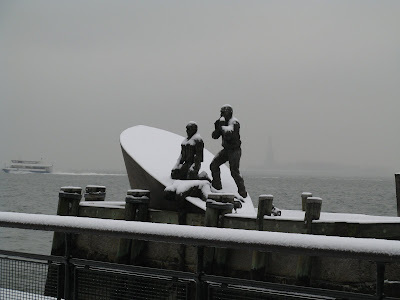 On reaching Battery Park, I couldn't resist taking another shot of the Merchant Marine Memorial, looking stark under snow. This was partly inspired by elbo ruum's post on WikiFray, which ought, in my opinion, to be retitled "Living in the Suburbs and Driving SUVs Turns People Into Assholes" (no, this isn't a message for you, Rudie - after all, it isn't even clear that you have an SUV - it's about those fuckwits you describe). Here in the City, the threat of snow isn't such a big deal (pace John V. Lindsay, whose mayoralty may have foundered because of his cavalier response to an impending blizzard); partly because we don't get that much of it most of the time, and also because the things you need are close at hand and involve a walk, or perhaps a short subway ride, to get. Of course, if you're affluent enough to own your house (but not affluent enough, or too parsimonious, to hire staff), you have to shovel the sidewalk and scatter some salt. 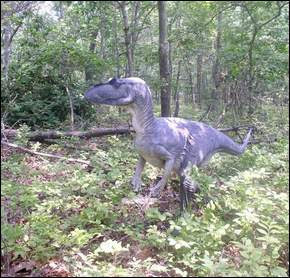 Whenever I go there, I get the feeling I'm going back to the Mesozoic, where an encounter with Allosaurus fragilis in the thin forest scrub (as here, in the Naples Botanical Garden) isn't unthinkable (photo courtesy of news-press.com, via dinosaurnews). Update: For a cautionary (pre-dino replicas) tale about the Naples Botanical Garden, see this.